It is the goal of nearly every solo entertainer to design their cartage to facilitate there being only one trip from the car to the venue, and at last, here it is. Place the two column elements in the padded shoulder bag, carry the subwoofer in one hand and the guitar or keyboard in the other, and off you go. The MAUI 28 G2 is equipped with two 8 in. woofers, sixteen 3 in. full-range speakers and two 1 in. neodymium HF drivers. They are driven by a light Class-D power amplifier with 2000 watts peak power for solid bass, balanced mids and precise and silky highs. The DynX DSP technology from LD Systems provides a top-class performance every time and the highest level of freedom from distortion. It includes a multiband limiter that protects against overloading, an EQ, a compressor and a 3-way crossover with run time correction. The design of the MAUI 28 G2 line array achieves an increased resistance to feedback and a wider space coverage, which makes separate monitor speakers superfluous. The wave guide of the tweeters has been developed using the Boundary Element Method (BEM), a numerical simulation of the sound radiation and dispersion. It reduces reflections from the floor and ceiling and prevents sidelobe levels and thus achieves an homogeneous dispersion. Your audience hears you in the back row just as clearly as in the front. With the integrated 4-channel mixer, system presets for mono or stereo configuration and Bluetooth Audio Streaming, you have full control over the system. Whether you are a singer-songwriter, solo entertainer, DJ or musician in a small band, you will be thrilled with the extraordinary sound and portability of the MAUI 28 G2. 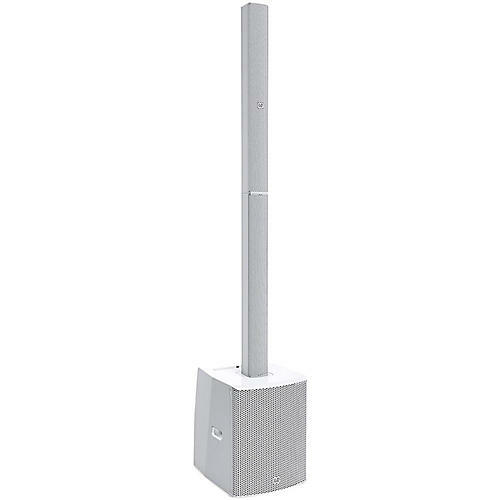 The column and the subwoofer can be set up separately: thus, the system is extremely flexible and is also an excellent choice for fixed installations. With a selection of clever transport accessories and special mounting hardware, the MAUI 28 G2 is a well thought out overall solution, down to the last details. A user-friendly solution for medium sized venues and fixed installations. Striking white finish. LF driver:	2 x 8 in. MF driver:	16 x 3 in. HF driver:	2 x 1 in.